Ryan L. Nelson, D.O. is a fellowship-trained orthopedic surgeon that practices general orthopedics. 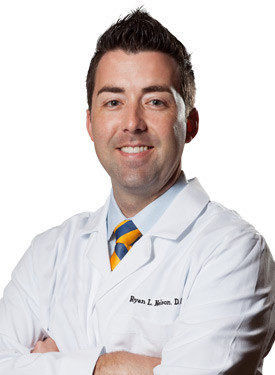 He is one of the only surgeons in Oklahoma to have received fellowship training in shoulder and elbow surgery from the American Shoulder and Elbow Surgeons Association. Dr. Nelson can perform complex procedures including total shoulder replacements, reverse total shoulder replacements, rotator cuff and labral repairs and elbow joint replacements. A native Oklahoman, Dr. Nelson provides complete care for sports medicine injuries, hip and knee injuries, degenerative arthritis and workplace accidents. He is board certified by the American Osteopathic Board of Orthopedic Surgery.